To improve the soil water removal efficiency of drained farmland, and thereby increase crop yields, new drain lines are often installed between pre-existing drain lines. Retrofitting an agricultural subsurface drainage system in this manner requires accurate maps of the drainage pipe that is already in place. Repairing poorly functioning portions of a subsurface drainage system likewise requires an accurate field map of the drainage pipe network. Furthermore, to better evaluate the overall environmental risk of nitrate and phosphate release into the environment from farm fields, the intensity of subsurface drainage practices within an agricultural landscape needs to estimated, which can be accomplished if drainage pipe maps of the area are available. Consequently, there are both economic and environmental benefits to finding effective and efficient methods for mapping agricultural subsurface drainage systems. Thermal infrared orthomosaic of field in Ross County on May 14, 2018, showing drain line locations. Expanded field areas on left are provided to better depict thermal infrared drain line responses. This combined thermal infrared image is generated by stitching together a large number of individual thermal infrared photos. Although there has been considerable drainage pipe installation activity within Ohio and the Midwest U.S. recently, a substantial amount of the in place drainage pipe is much older, having been installed 30, 50, or even 100 years ago. In most cases, a map of the original subsurface drainage system installation is no longer available. Finding drain lines with heavy trenching equipment causes pipe damage requiring costly repairs, while the alternative of using a hand-held tile probe is both time consuming and extremely tedious. 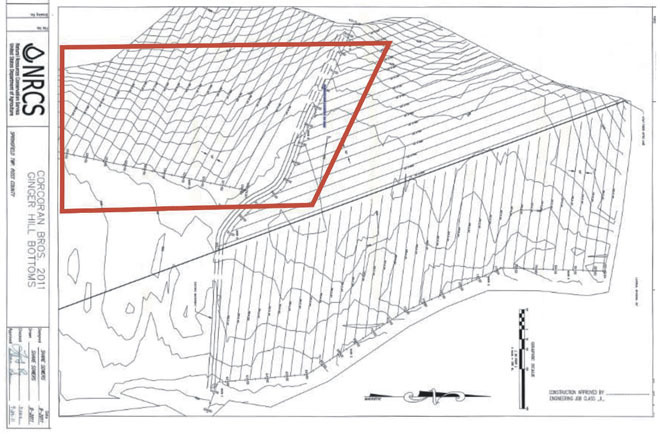 Ground penetrating radar (GPR) has proven capable of locating buried drainage pipe under a range of soil conditions; however, GPR is somewhat inefficient for providing detailed maps of subsurface drainage systems in large farm fields. Drones capable of obtaining thermal infrared imagery may have the capacity for effective and efficient drainage pipe mapping. Differences in soil moisture directly over a drain line versus between drain lines lead to differences in the emitted heat energy directly over a drain line versus between drain lines. These differences in the emitted heat energy can be detected with thermal infrared cameras, thereby providing indications of drainage pipe locations. Drones allow the flexibility of obtaining thermal infrared imagery when field conditions are favorable for mapping drain lines. 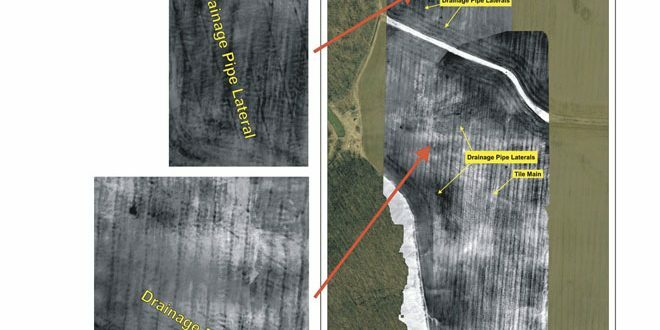 Scientists from the USDA/Agricultural Research Service — Soil Drainage Research Unit (USDA/ARS-SDRU) and the Ross County (Ohio) Soil and Water Conservation District (RCSWCD) have initiated a study using a drone with a thermal infrared camera to map subsurface drainage in agricultural settings. Although the study has just begun, initial results appear promising. As a whole, that under these conditions, thermal infrared imagery obtained with a drone worked fairly well delineating drain lines. This is the as-built map of the subsurface drainage system with the area covered by the thermal infrared orthomosaic outlined in red. To obtain the required resolution to produce these thermal infrared orthomosaics, it is oftentimes necessary to fly the UAV at lower altitudes, which creates an extremely large number of individual images. For example, the thermal orthomosaic overlay consists of around 2,000 images. Within the entire field, well over 7,500 thermal images were obtained. Those types of numbers create potential issues for the software’s ability to create a useful thermal infrared orthomosic. Processing this large amount of data can take several hours, or even a full day. Currently, there are very few software vendors that have the ability to create these orthomosaics from thermal imagery. To further complicate the issue, most appear to only support one or two thermal cameras. Hopefully this will change as the technology progresses. Based on this initial drone survey, drainage pipe mapping with thermal infrared imagery certainly exhibits promise, but further research is definitely warranted. USDA/ARS-SDRU and RCSWCD scientists plan to conduct further thermal infrared drones surveys at a number of different field sites having different soil types, crop residue, and tillage practices. Additionally, at each site, thermal infrared drone surveys will be carried out under a range of field wetness levels. The project goal will be to develop guidelines as to when and where thermal infrared drone surveys can be employed to map agricultural subsurface drainage systems. Barry Allred is a Research Agricultural Engineer for the USDA – Agricultural Research Service Soil Drainage Research Unit at 590 Woody Hayes Drive Columbus, Ohio 43210. He can be reached at Barry.Allred@ars.usda.gov. Greg Rouse is the GIS Coordinator for Ross County Soil and Water Conservation District at Ross County Service Center 475 Western Avenue, Suite H Chillicothe, Ohio 45601. He can be reached at grouse@rosscountyswcd.org.